Well, a few girlfriends and I are leaving for a personal trip on the West Coast Trail in a few days and the last minute details are starting to come together. 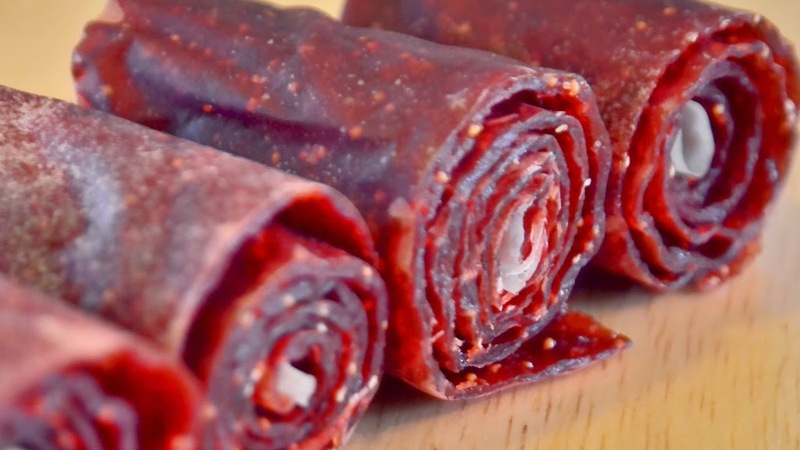 Nicole said she was going to make strawberry fruit leather…and then roll Nutella up in it (Oh wow, your now talking my language). That sounded like something I might be able to pull off in the next few days. 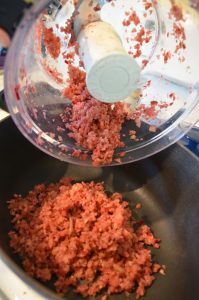 Upon driving home I realized the Rhubarb plant in the garden would be the perfect pairing for this particular endeavor….Eureka! 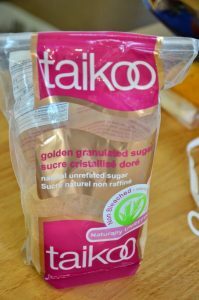 After looking up how to make strawberry fruit leather on the internet there are loads of recipes but all involve adding sugar to reduced fruit puree, something my brother is amazing at finding alternative sources of natural sugar to sweeten items of sort. 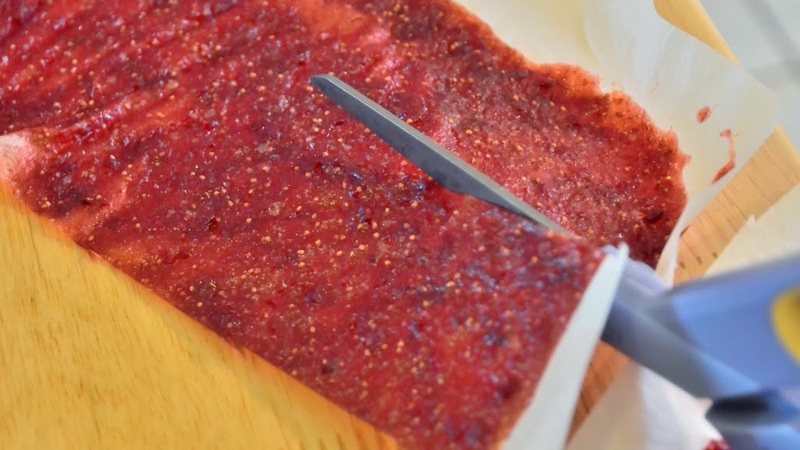 Last fall he created a crab-apple butter that was like candy in a jar! He said he used apple juice concentrate as the sweetener. 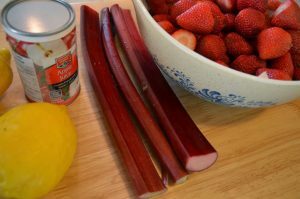 So this is my attempt at creating Strawberry Rhubarb fruit leather by substituting apple juice concentrate instead of refined sugar. 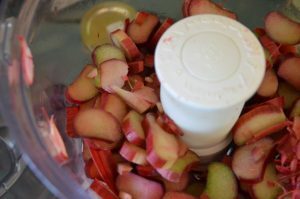 I ended up having to add a little unrefined sugar to cut the tartness of the rhubarb, but much less than other recipes were calling for, and nothing that had been bleached in the process 🙂 You can easily adjust the amount of strawberry or rhubarb in the recipe depending on what you have available and/or what flavour you are trying to achieve. 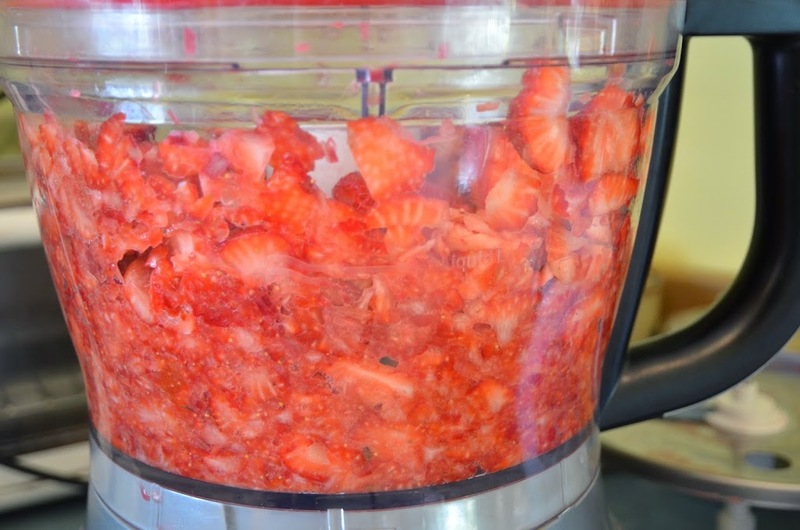 Add apple juice concentrate to the strawberry rhubarb sauce and reduce until sauce thickens. 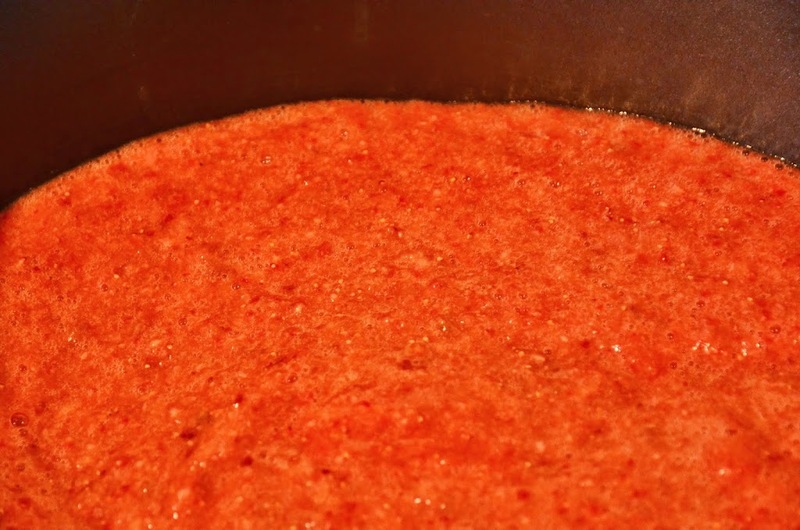 I did mine for about an hour on a low simmer, you can do more or less depending on consistency – it should be thick enough to spread and not run on the parchment but doesn’t need to be so thick that it resembles apple sauce. 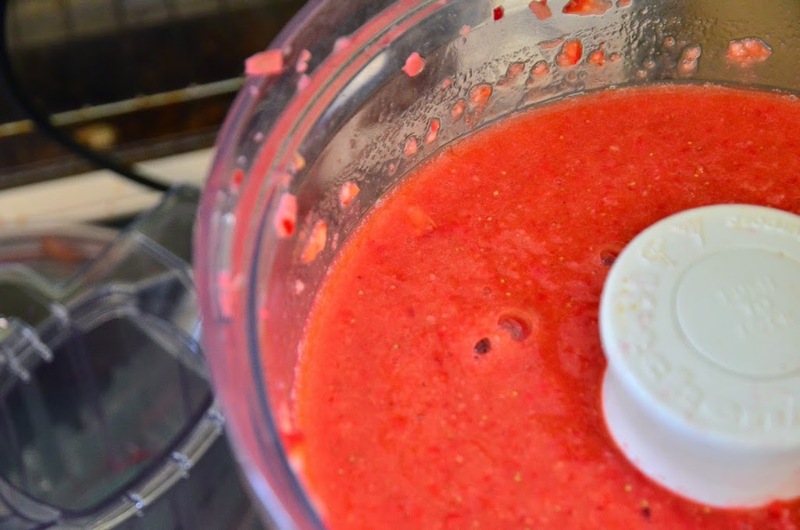 Add 1/2 cup of sugar and dissolve completely, simmer another 10 minutes. 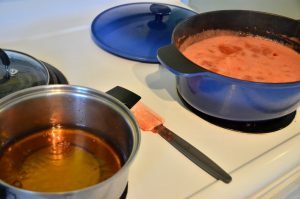 Sauce will thicken a bit more after it is removed from the heat. 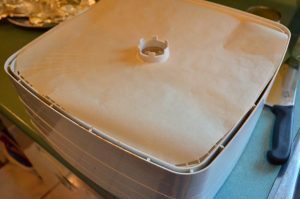 Cut parchment paper out in the same shape as your dehydrator. 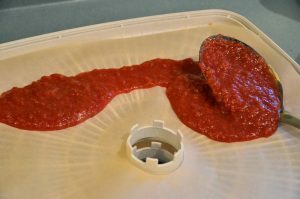 Spoon Strawberry Rhubarb sauce onto the parchment and smooth out. It should be thick enough that you can’t see the parchment underneath. 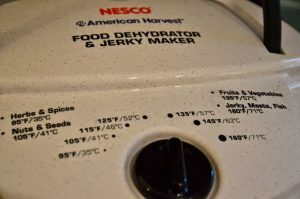 The thicker the sauce the longer it will take to dehydrate and the thicker your leather will be. 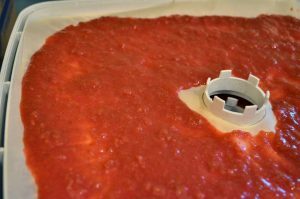 The finished product should be soft and pliable – cut it into strips and roll it up….possibly with Nutella…mmmmmm.